Running a profitable ecommerce store is not an easy task. If you are not using the right promotion tactics, it will be difficult for you to grow your business. You need to use the best ecommerce promotion ideas to get ahead of your competition. You need to consider a lot of factors while creating an ecommerce marketing strategy for your brand. According to Statista, 90% of US adults find personalized content appealing. Also, 75% of consumers like to purchase from a retailer that recognizes them by name or recommends options based on past purchases. In other words, they like shopping from a retailer that knows their purchase history. So provide your customers with a shopping experience that is customized to their preferences. This will not only improve your customer retention, but also expand your customer base. Personalization requires integrating customer information into services so that specific services or offers become highly relevant. The more relevant your offers are to your customers, the better the chances that they’ll buy from you. Implementing this ecommerce promotion idea requires a better understanding of your customers. As an ecommerce brand, you need to know your customer’s browsing history, interests, and preferences. Then send them personalized promotional messages. But you need to make sure that your messages are relevant and targeted. Remember not to go overboard with personalization lest the shopper feels that their privacy is being invaded. Amazon offers advanced personalization with their artificial intelligence, machine learning, and predictive analytics. The ecommerce giant uses the customer’s purchase history, items they’ve looked at, and items they’ve rated or liked. It also records and recommends what other buyers of those same items have purchased. Email marketing is all about sending promotional emails to people who have opted in to your email list. According to Campaign Monitor, email marketing leads to 174% more conversions than social media marketing. The reason for the effectiveness of email is that it is more personal than the other communication channels. You get to take the conversation about your products to your customer’s private inbox. This is a great way to maintain and strengthen your brand-customer relationships over time. In today’s competitive world, there’s little chance of people returning to your website again. Therefore, collecting email addresses from your visitors is important. Build an email list to remember your customers and retain more of the traffic you earned with your hard work. Ecommerce brands need to constantly work on ways to improve their email open rates and engage customers. For example, DoggyLoot is an online retailer with great deals on dog products such as toys, chews, food, health, treats, and accessories. 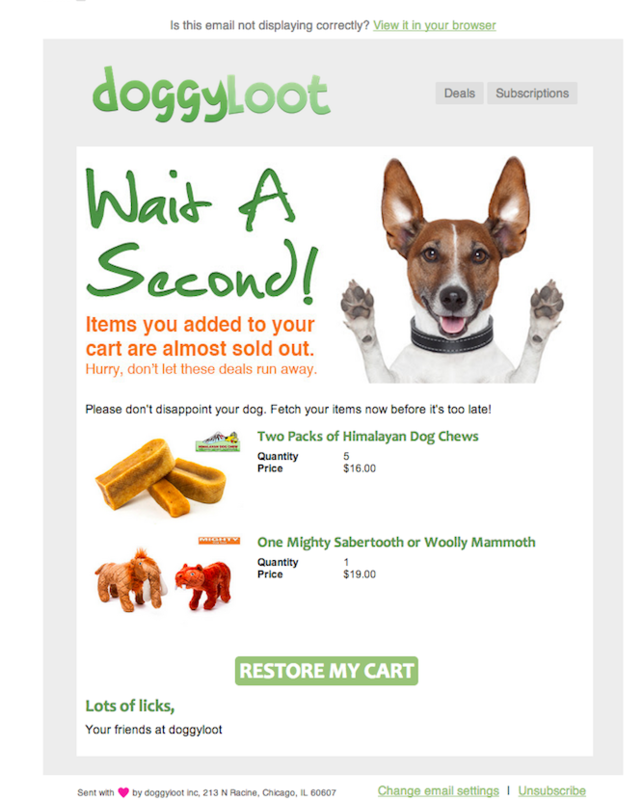 They send a very cute but effective cart abandonment email to their customers. As you can see, the tone of the email creates a sense of urgency but it’s not too salesy. Influencer marketing is one of the best ecommerce promotion ideas for connecting and engaging with your customers on social media. Influencer marketing is known to generate 11x better ROI than the traditional marketing methods. When done effectively, influencer marketing offers valuable insights into customer behavior and patterns. It provides for authentic customer engagement and thereby, helps build strong relationships with them. It’s advisable for every ecommerce brand to use this powerful ecommerce promotion idea to increase conversions. Tools like Grin will help you to manage your influencer marketing campaign from the very beginning till you wrap-up. It allows you to track your entire campaign and you can see the progress of your campaign on a single dashboard. Also, influencer marketing makes it possible for ecommerce brands to target a specific customer segment. It helps foster brand loyalty and increases your brand’s visibility. For instance, the cosmetic brand, Josie Maran, collaborates with influencer, Kira Paran who runs the blog, Northern Style. Kira is a lifestyle, fashion, and beauty blogger and an Instagram icon. Josie Maran chose Kira as her content went well with their argan oil line. A lot goes into running an efficient ecommerce store. One of the most lucrative ecommerce promotion ideas is to make your website mobile-friendly. In the last quarter of 2017, 75% of the US population was using their mobile devices to browse the internet. With the increased use of smartphones and smart gadgets in the world, mobile ecommerce is a must. Brands need to shift to a responsive web design that resizes automatically according to the screen size of the device. In this technique, the site design remains attractive and easy to navigate regardless of the device being used. An increasing number of ecommerce sites are optimizing for mobile every day given the popularity of the mobile. 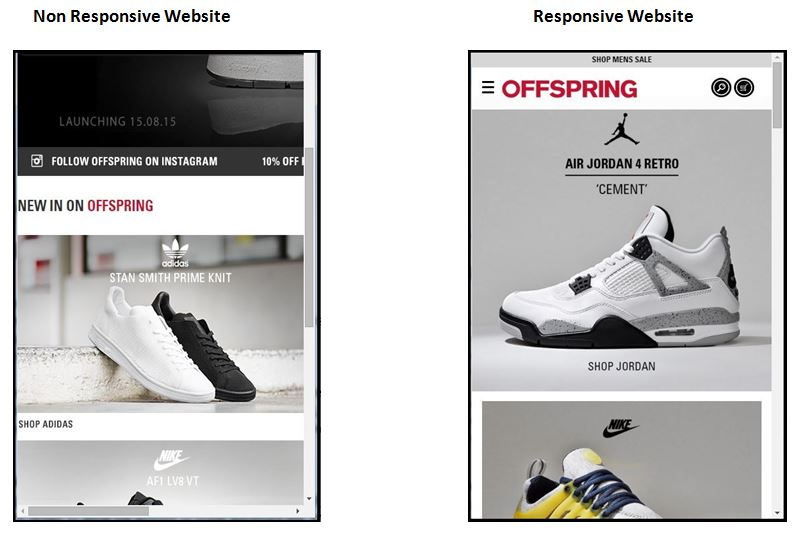 Offspring, for example, made their website mobile responsive and is the perfect case study to prove this point. The visibility of their first page increased by nearly 78% in just three months. And the store was successfully able to increase their conversion rate by 15.19%. Free shipping is another productive ecommerce promotion idea to lure customers. It is often a decisive factor for customers who are shopping with a brand. Customers are usually apprehensive about the worth of the product while buying online. Free shipping helps alleviate these fears and makes those impulse purchases more attractive. Free shipping can also reduce cart abandonment, which means an increase in sales. One effective way to use this strategy is by offering free shipping on orders over a certain amount. This often leads to shoppers adding more items to their cart to reach the minimum requirement. This encourages sales and increases revenue for the store. Verge Girl is an online women’s fashion store that sells dresses, jeans, jackets, and accessories from international designers. The brand offers free express shipping worldwide for purchases over $50. And they offer free shipping by default to all US and New Zealand shoppers. Another strategy that works is offering free shipping as part of membership. This can encourage more shoppers to sign up to get free shipping. This strategy improves customer loyalty and allows you to collect more information from shoppers when they sign up. If your ecommerce store does not offer a free shipping option for your customers, it’s time you consider doing so. These are five of the best ecommerce promotion tactics that have been proven to work for many ecommerce stores worldwide. Test them out and experiment with different combinations. Measure the results and discover the best ecommerce promotion idea that works for you. What ecommerce promotion strategies do you use? Are they effective? Please share them with us in the comments section below.